Follow a heart healthy diet as heart disease is the number one complication of diabetes. Learn about which foods are high in carbohydrate and which are healthier carbohydrate choices. Learn, too, about correct portion sizes for yourself. The American Diabetes Association (diabetes.org) has books and resources to get you started. For an individualized meal plan, make an appointment with a Registered Dietitian or Certified Diabetes Educator. Contact your insurance company to locate someone who accepts your insurance. You can also search for community diabetes education classes. If you live in Suffolk County, NY, call Cornell Cooperative Extension of Suffolk County Diabetes Education Program (Jane Juran: 631-747-7820 ext. 340). Leave a message for Jane with your contact information, including email address, and you will be informed of all upcoming diabetes education classes. Learn about The Plate Method. This is an easy way to start eating healthfully with diabetes. Imagine your plate divided into three sections. Fill one-quarter of your plate with foods high in carbohydrates and starch such as pasta, rice, beans, potatoes, and corn. Fill another quarter of your plate with a healthy protein choice like chicken or fish. Then fill the other half of your plate with non-starchy vegetables such as broccoli, spinach, zucchini, green beans, and salad. Make sure to include small amounts of your favorite treats. Just because you have diabetes doesn’t mean you can never have small amounts of sweets or rich food. You just have to learn to balance by monitoring your portion size of sweet/rich food and testing your blood sugar to see if it stays within the target range established by you and your provider. Always test your blood sugar to see if your medication and lifestyle choices are working well for you. Testing your blood sugar frequently, on a schedule decided by you and your provider, can help you see how certain foods, medications, and varying activity levels affect your blood sugar on a day to day basis. 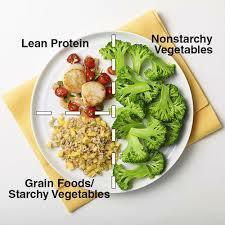 You can then make adjustments in your meal plan or portion sizes based on your testing results. This is called pattern management. If your blood sugar stays above target or gets too low, notify your provider (or go to the ER). Low blood sugar, also called hypoglycemia, is defined as a blood sugar less than 70mg/dl. Changing your diet, increasing your activity level, or taking certain medications can lower your blood sugar. Hypoglycemia can be dangerous. You can pass out, have a seizure, or go into a coma. It is important to learn the symptoms (ex. feeling shaky, sweaty, dizzy…), treatment, and prevention of hypoglycemia. Also realize that some people might have no symptoms at all. To prevent or treat low blood sugar, you should always carry a fast-acting sugar to swallow (like ½ cup juice -small juice box, 1 tablespoon or 3 packets of sugar, tube of glucose gel or glucose tablets(follow directions on label, usually take 3 or 4 glucose tablets). All of these choices contain about 15 grams of carbohydrate. Check your blood sugar in 15 minutes; if it is still below 70, repeat steps and take another 15 grams of fast-acting sugar. Call 911 if you can’t swallow or your blood sugar drops. Some people may need a shot of glucagon. Also, carry a snack with you to stabilize your blood sugar after you treat it. Contact your provider, go to the hospital, or call 911 if this happens frequently. Share this information with family members and coworkers so that they can help you in case of an emergency. Eating three evenly spaced, balanced meals with about the same amount of carbohydrate at each meal can help prevent hypoglycemia. Alcohol can cause hypoglycemia, so check with your doctor to see if it is safe for you to have alcohol. If so, learn how much and when to consume it. You should never drive a car when experiencing low blood sugar, so always test your blood sugar before driving. Also remember to contact your provider if your blood sugar stays above target range. If it remains over 200mg/dl and you can’t speak with your provider, go to the ER. Have a Happy and Healthy New Year!!! *This article is not intended to take the place of a professional medical examination. Please see your health care provider to discuss your concerns.